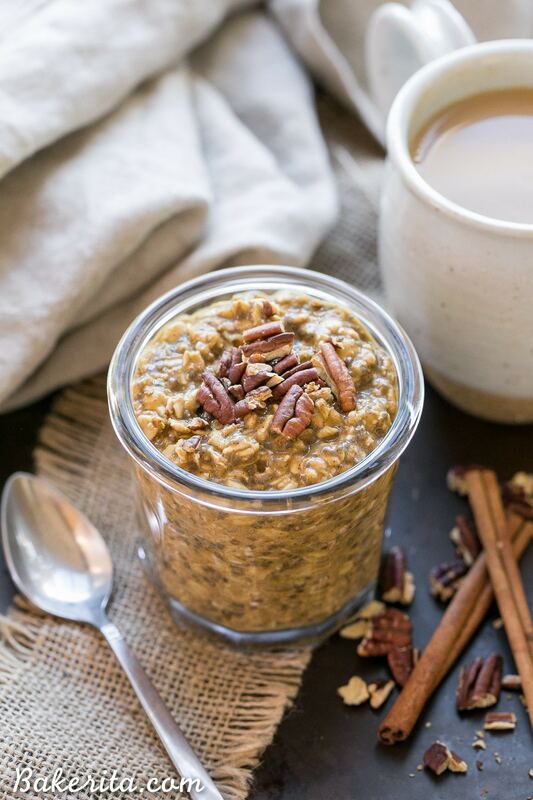 These Pumpkin Spice Latte Overnight Oats, with pumpkin puree and cinnamon, will help you start your morning deliciously! Prep only takes a few minutes and they can be enjoyed straight from the fridge or warmed up. So tell me, do you buy into the pumpkin spice craze? Are your shelves filled with pumpkin spice coffee, cereal, candy, and creamer this time of year, with a PSL in hand on the daily? I feel like it’s REALLY blown up these past few years, with pumpkin spice EVERYTHING dominating the shelves. I gotta say, I’m pretty into it because I love warm fall spices and I love trying new products. But it’s not just the stores where pumpkin spice blows up…from September to November, pumpkin spice everything permeates the blogging world. So here I am, throwing one more pumpkin spice recipe into the web – it’s a good one though, I promise. 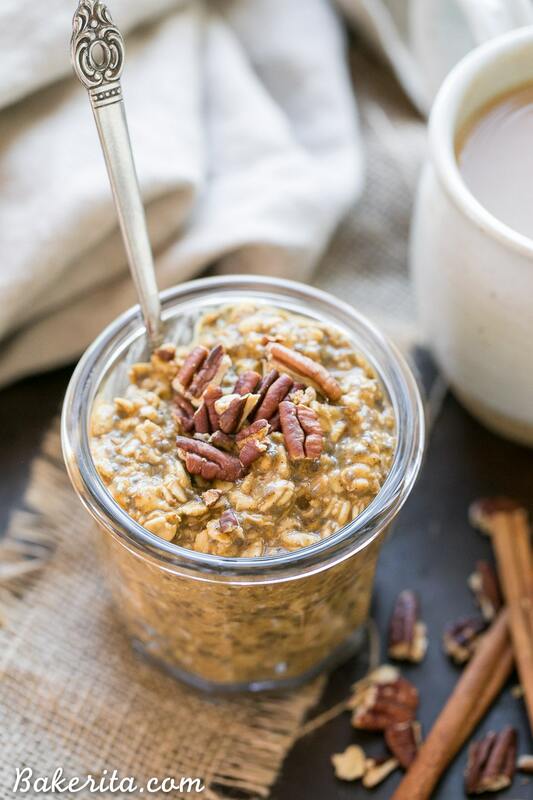 These Pumpkin Spice Latte Overnight Oats come together in a flash, like most overnight oat recipes. Just stir together all the ingredients, and let them sit for at least 4 hours but preferably overnight. Then eat. I love when things are that no-fuss, and breakfast is ready and waiting for you when you wake up. 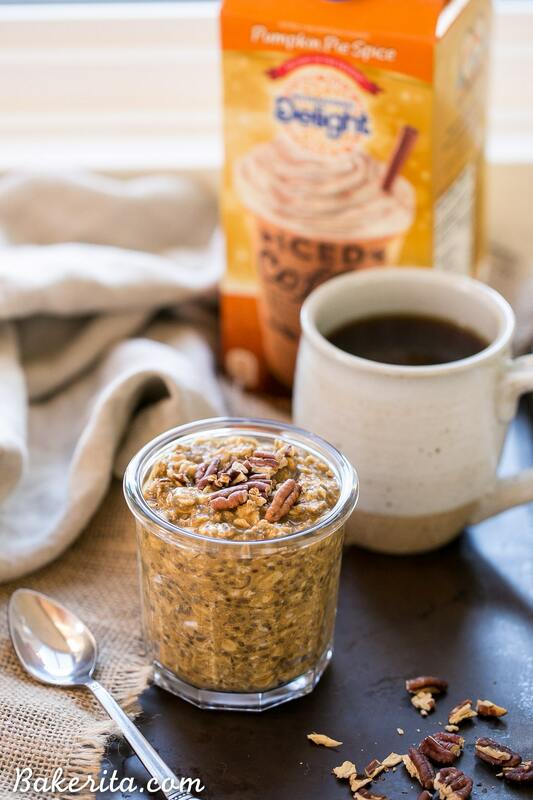 So, the pumpkin pie spice iced coffee is mixed with rolled (NOT instant) oats, a little bit of maple syrup, pumpkin pie spice, pure pumpkin puree, and a tablespoon of chia seeds. Stir it all together, put it in the fridge, and enjoy. In a medium bowl, combine all of the ingredients and whisk until smooth. Divide into two small jars or containers, cover, and let sit in the refrigerator for at least 4 hours, or overnight. Serve straight from the fridge, or slightly warmed. Keep in the fridge for up to 5 days. I’m definitely ALL over the pumpkin spice craze! From lattes to cereals, oatmeal and more, I love it! 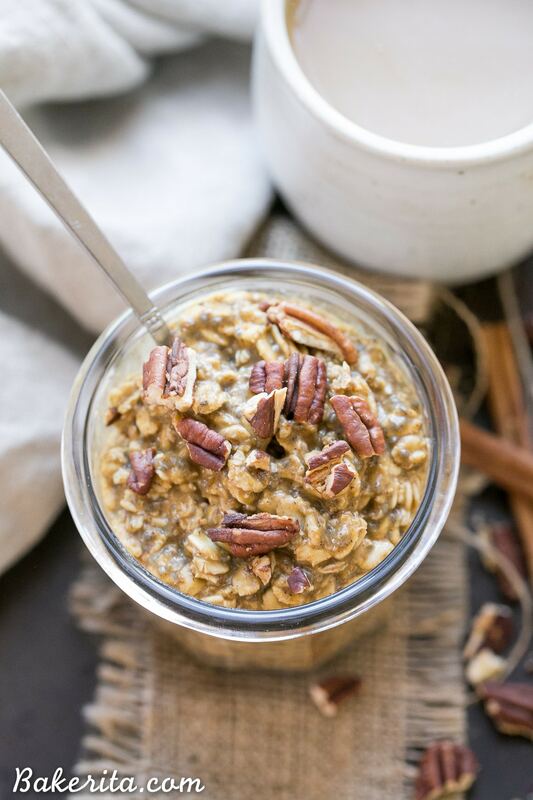 These oats look delicious, Rachel! I actually just made a pumpkin pie version, so I’m loving your latte ones! So perfect for fall! Haha, your blog name definitely says it all Gayle! :) Thanks so much! This sounds comforting! I just made my own pumpkin spice syrup and can’t wait to put it in everything. Oooh that sounds SO amazing, Megan! I am on to the PSL craze too and I am not sorry at all. Love the sound of these! I think it is not only delicious but also a heathy breakfast. And because I have to start my day at 6:30 am, a few minutes is a great amount of time to make my breakfast. Maybe I will try it tomorrow. Thanks a lot for sharing!!!! By the way, I love warm fall spices, too!!! !